God: "But actually Pokémon isn't stupid, and is a great meaning of life." Philosopher: "Uh, is there like...another God I can talk to?" God: "Zeus I guess, but he likes Pokémon even more than me." 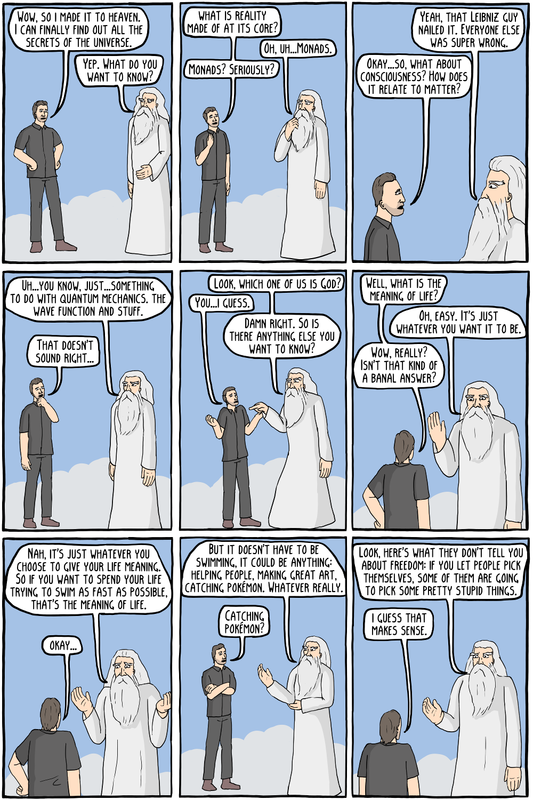 The title of the comic is, of course, an homage to Dead Philosophers in Heaven, the first, and some say the great, philosophy themed webcomic. While I can't comment on the overall quality of their comic vs mine, they did create the greatest single comic in history. The guy is drawn off of Nick Gibbs, one of the co-creators. Sorry other dude who makes Dead Philosophers in Heaven, but you should really be on twitter.